I have a new-found appreciation for what the average Korean student has to endure nearly every day of their high school careers. 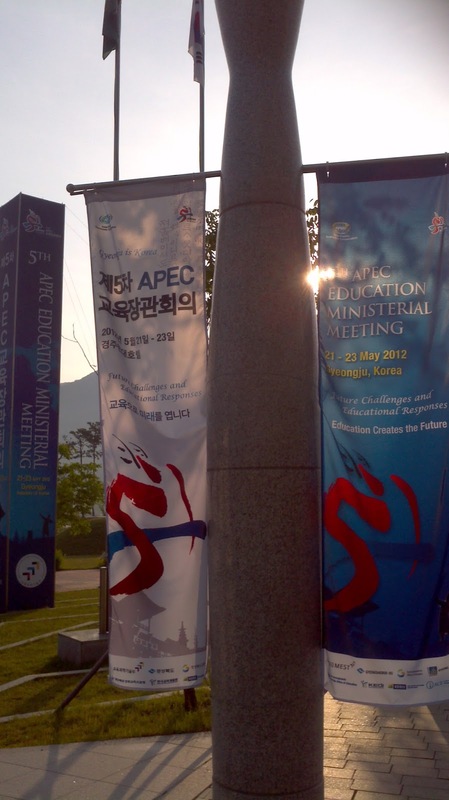 Last Monday, my school participated in a “Good school 2012” festival, known as APEC. It was a pretty big deal, with schools coming in from all over the province. I had been volunteered to do a dance performance with some of the students at the festival. So, since the students were only free during lunchtime and in the evenings after dinner, that’s when we had to practice. And for 1 week and change, I lived the life of a Korean high school student. I went to school at 7:00 or 7:30, and didn’t leave until 10:00. I taught all of my regular classes, and then practiced dance in the evening. Only one or two other times in my entire life have I experienced such bone-deep exhaustion. I didn’t think such complete weariness was possible. And I thought to myself….Korean students do this every single week for 3 solid years! It’s truly incredible that they don’t all drop dead from exhaustion. But we finally finished, the performance is over, and I can get some rest again! I’ve included some pictures from the festival below. Oh, also, in other news, I finally got my hands on the footage from the TV filming 2 weeks ago! 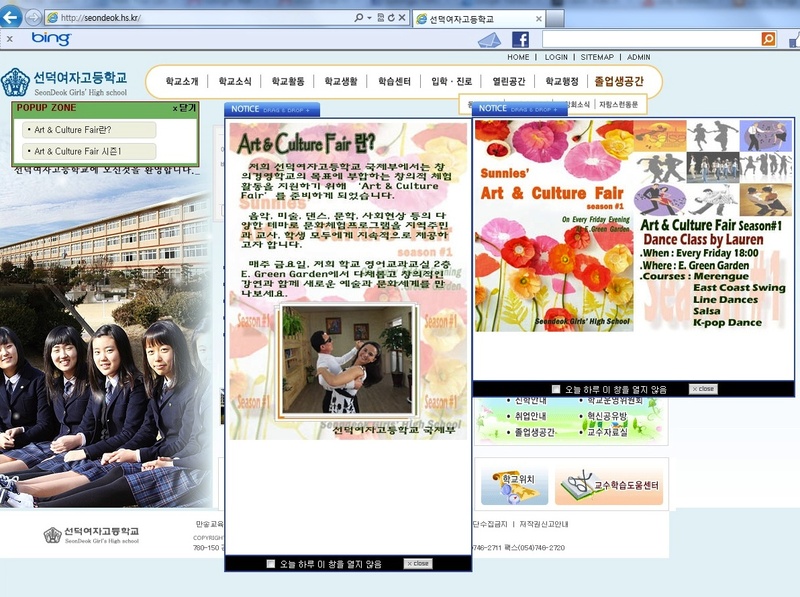 Here it is: http://asx.kbs.co.kr/player.html?title=%C6%AF%C1%FD&url=1TV%2420120521%24special20120521_01_00_00_m&type=201&kind=300_2week#. You’ll have to log in to see it, but one of my students has very graciously given me her log-in information so that you can watch the footage. As the vast majority of my readers don’t speak any Korean, I’m not too worried about anyone using her information for nefarious purposes; please don’t prove me wrong!! Her ID is tjr213, and her password is chaeyeon8524. My school’s coverage starts around 38 minutes and 30 seconds. You might have to watch it in Internet Explorer, so if it’s not working, trying switching browsers. I can’t believe they were here all day for a 4-minute final product!!! Some of the signs for APEC, as seen all over town….yeah, it was a big deal. The stage that we performed at. It was huge! Our school, Seondeok high school, was named after a famous Korean queen. So we had a student dress up like Queen Seondeok and go around taking pictures with people. It was cool :). Some random guy who asked to talk a picture with me. I have no idea who he is, lol. There are several stages of culture shock when living in a foreign country for an extended period of time that are pretty generally accepted. The first stage is the honeymoon stage, when everything is new and exciting and exotic. After that comes withdrawal and depression, when everything is hard and overwhelming and nothing seems exciting anymore, just difficult. All you can think of are the days when you understood everything around you and always knew what you were eating. My honeymoon stage lasted probably all of orientation and maybe the first day or two of living in Gyeongju. But after that, the second stage hit me hard and fast. No matter what I did, no matter how hard I tried, I couldn’t do anything right, couldn’t understand anything. It’s been like that for four long weeks. But the third phase is assimilation, when you finally come to terms with the fact that you won’t be able to understand everything that’s happening around you, and that’s ok. You’ve begun to find your own niche, regardless of the cultural differences. I think that I’ve finally embarked on phase 3. This has been a week of assimilation, niche-finding, and friend-making. Over Chuseok, one of my adopted uncles had given Songi (my host sister) 50,000 won (roughly $50) to buy something for me. So on Tuesday afternoon, Songi and her best friend took me shopping! It was the first time that I had really hung out with Koreans outside of school or the homestay, and it was a blast. They wouldn’t let me buy anything for them while we were shopping, so I insisted on taking them out to ice cream after. Then we went to a norebang (Korean karaoke) – in the middle of the day! It was kinda weird, but fun. After that, we took sticker pictures! Korea is famous for these – they’re like photobooths in America, except after you take the pictures you have to decorate them with stickers and cutesy designs before they are printed. The place we went to was a tiny little hole-in-the-wall in which all of the signs weren’t even in Korean – intimidating enough – but rather, Chinese characters. I would have never ever stepped foot in that place by myself, but it was alot of fun. Thursday night was salsa night, but I didn’t go this week. I was so tired, but I didn’t really want to stay in the house all night, so I was kind of looking for an excuse to do something other than salsa. Well, lo and behold, I got what I wanted! I got a message from another English teacher, Jennifer, who said that she was looking to make some more girlfriends, and would I be interested in sometime meeting up with her? I said yes, and so we met up later that night for tea – we both got green tea lattes, yummm :). Of course, neither of us thought to get each others’ numbers, and so we had a rather hard time finding each other at the tea shop, but we eventually figured it out – life in Korea, always an adventure! The shop that we went to had some games in it, so we played Jenga while we talked. We actually ran out of moves! I’ve never seen a Jenga game come to a draw….I didn’t know what to do, lol… But I had a really nice time. It was good to get out of the house and spend some time with another girl. A draw in Jenga?? How does that happen?? What do we do now? On Thursday afternoon I had a photo shoot with my principle. It was really awkward because, although he dances, he doesn’t speak English, so I didn’t know what kinds of dances he knew. So I just kind of stood there and let him take a position, and then I arranged myself accordingly. By Thursday night, our picture, accompanied with a flyer on my wonderful new dance class – was the new home page of the school website. I’m not kidding. Check out his shades. My principle is awesome. So Friday evening comes around (it’s a 6:00 pm class), and I’m a nervous wreck. I had no idea what to expect – not even a clue as to how many people would show up. Well, I got my answer soon enough. Forty-two students, plus about ten teachers, came to learn basic merengue. Thursday afternoon I had sent a message to Anthony, asking if he would help me teach. He agreed, and I am eternally indebted to him. It was so nice to have a friendly face, a sense of solidity next to me in the craziness of the class. And of course, all of the girls loved him :D. At the end of the lesson, they asked us to do a demo – I really think that they believe that I’m far better than I actually am, but they enjoyed it. After Anthony and I danced, we brought in some of the teachers and then danced with them. The students really liked that. It was really hard trying to teach over 50-something giggling high school girls, but it was worth it. I had a blast :). After dance class, Anthony and I went to get something to eat. I had biked to school that morning, while he had taken a taxi, ergo – 2 people on a bike! I had never done that before. It took a while to get the hang of it, and we had a couple of spills, but we caught on pretty quickly. I felt like such a local :D. He took me to this tiny little Japanese restaurant in the center of downtown. So we got some yummy food which I have no idea what it was called or what it was and just talked. After I thanked him for the millionth time for helping me, he was like, “Lauren, you’re my sister in Christ. Of course I’ll help you if I can. All you have to do is ask.” It was so comforting to know that I have someone looking out for me here :). Friday was also one of the English teacher’s last day, so we had a cake and said goodbye to Borim. It was really sad to see her go :(. But she told me more than once that she really wanted to see me and hang out with me (she’ll still be in Gyeongju), so hopefully we’ll make that happen. Oh, I also had an awesome teaching moment today! Just before class, one of my students came up to me and started a conversation with me (which in itself is pretty rare…they’re all sooo shy to speak English). She had written out a script beforehand, so she bumbled through it: “Teacher, I no speak good English, but I want talk more with you. Is ok?” She was so cute, and I appreciated her efforts so much. Made my heart swell :). I can’t believe how much I love teaching. Sure it’s hard, and sometimes it’s frustrating, but I really really enjoy it. That kind of hit me as I was sitting at the restaurant with Anthony. I was describing to him the lesson that I had taught this week – it was about definite and indefinite articles (a/an/the). These words don’t really exist in the Korean language, so Korean students have a lot of problems using them properly. I told Anthony my topic, and he immediately asked me, “Wow, how did you make an interesting lesson out of that? ?” A fair enough question, lol. And so I started telling him….about the story that I introduced it with, and the schoolhouse rock song that we listened to, and the worksheet that we went through to check for understanding, and then the game at the end that everyone loved. It’s true, articles is a pretty boring topic. But it was one of my best lessons. I think that was when I realized how much I love my job. Well, the day’s a-wasting, time to get moving! Sending my love as always! !